Unless all of you are lying (which I highly suspect right now), you are all dying to hear about my European Adventure. I have never done a travel blog, but I have traveled and I have blogged, so there’s that. And now here’s this. First, let’s start off with the most Frequently Asked Questions. That many countries? Yes, but Croatia was only for 25 minutes, Italy for a few hours, France for a 20 hour layover, and Austria for a day. We mostly went to Hungary and Slovenia. Wait, hold on a second, you stay in contact with third and fourth cousins? Yeah, because then you can travel to cool places, duh! But you really do? Yes, my mom and I really do. And so do many of our other family members. Slovenia is a part of me. It is a part of my heritage and a part of my life. I’ll get to that part of the story, ok? How did you…? They all speak English. So on a cold day in December, my mom and I packed our bags, went to work (separately, of course), found out my flight had randomly (and no fault of my own) been rescheduled and I was headed to Michigan instead of Paris, and I about died. Luckily, the nicest customer service agent in the world fixed my flight, and when my mom and I left work and headed to the airport, we were back on the same flight. Thankfully the airport dude-man got us back in seats next to each other, which made it more convenient to pretend to uncomfortably sleep. But you wanted to know about Hungary. 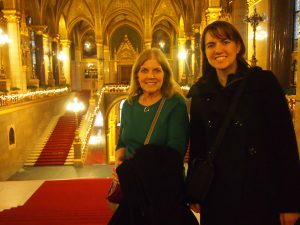 We took a direct flight to Paris and then on to Budapest, Hungary. My aunt and uncle were eagerly awaiting our arrival at the airport and I felt a complete surge of emotions and nostalgia as they stood there with their mission name tags on. 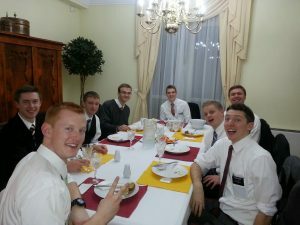 It was just like coming off the plane when I arrived in my mission and it felt like a piece of heaven. But I digress. We were so excited to see them! 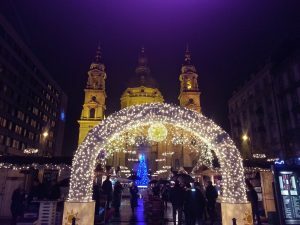 After hugs and warm feelings all around, we headed off into a cold and foggy December day in Budapest, where it proceeded to rain for the near duration of our stay. But it couldn’t have been any lovelier. 1) My aunt and uncle. The wonderful thing about reunions is that somehow it’s as if no time has passed at all and that all is right with the world and that there is just a burst of love escaping from you. They’ve been out two and a half years, which has seemed a very long time. We talked, we laughed, we played games, we fed the missionaries, we went to Church, we met wonderful members, we talked to more missionaries. Also, they shared their stock of Milka caramel candy bars. That is love. Family, guys. It’s where it’s at. 2. Christmas Markets and Christmas. These are really a big deal in this part of Europe. They sell all sorts of handmade crafts, dolls, linens, and nearly everything you can think of. And while there were lots of people buying and drinking mulled wine, we just enjoyed just smelling the Christmas in the air. Everything else was lit up around the city and it felt magical. 3. Hungarian Parliament Building. I could not get enough of this building. As one of Europe’s oldest legislative buildings, it just looks like awesomeness decorated and lit up in more awesomeness. Inside and out was beautifully designed, built, and decorated. 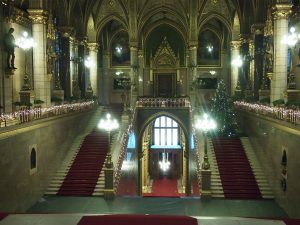 It was inaugurated on the country’s 1000th birthday in 1896 (it’s a pretty important year for Hungary) and completed in 1904. 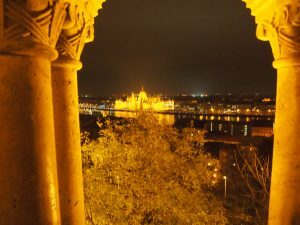 Hungarian Parliament Building, as seen from Fisherman’s Bastion on the Buda side of the Danube. 4.These ladies. I know I already mentioned my mom and my aunt, but seriously, isn’t this the best picture ever? 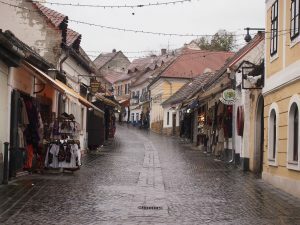 My Aunt Lynne helped us find our way around the city and took us out to a beautiful village named Szentendre where we got to see a taste of traditional Europe, shop in some great artisan handmade shops, and eat some cold blueberry soup and fried cheese! Goodness all around. 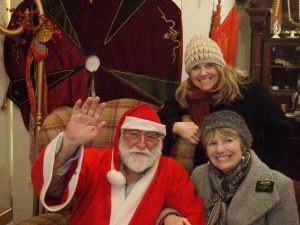 Oh yeah, and we met Saint Nicholas! 5. Memorials to the Jews. This was such a sobering and thoughtful opportunity to really think on the implications of all that transpired in World War II. 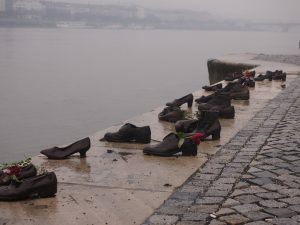 The “Shoes on the Danube” Memorial is for those Jews who were lined up and chained together along the Danube. They were ordered to take off their shoes and stand near the edge. The first person was shot, and the others, chained to the first, would be pulled into the river. I’ve heard a lot about the Hungarian Jews in history, but this was sobering and real to me. I love that people put flowers in the shoes…to remember. Another memorial to the Jews is at the Dohany Street Synagogue (also known as The Great Synagogue). 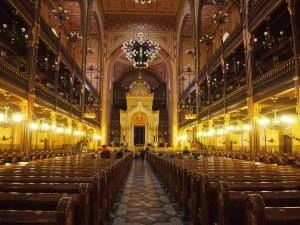 It is the largest synagogue in Europe, built in the 1850s. It was badly damaged by air raids during the Nazi Occupation, but was restored due to some great donors. 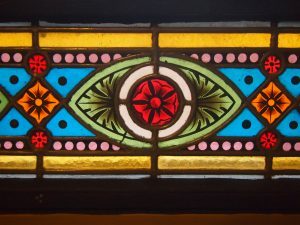 The restoration was completed in 1998. 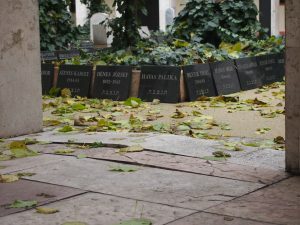 It’s very unusual to have a cemetery this close to a synagogue, but in 1944, around 70,000 Jews were relocated to the ghetto area of Pest and in the following year 8-10,000 of them died. A makeshift cemetery was created for around 2000 of these Jews in the Synagogue courtyard. In the Raul Wallenberg Memorial Park, the weeping willow tree–Emanuel Tree–memorializes the names and tattoo numbers of those Hungarian Jews killed in the Holocaust. There is also a memorial here to those who helped rescue Jews. 6. 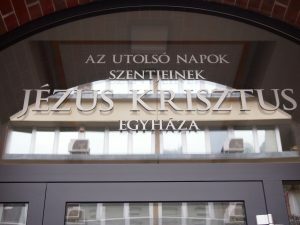 The Church of Jesus Christ of Latter-day Saints in Hungary. I love going to Church wherever I go. It’s always so wonderful to meet the members and understand more about their lives. We attended the Buda Ward, which is in the same building as the mission home and the mission office. It still felt much like home to me. The Church always feel like home. We had translators help us out through all three meetings. 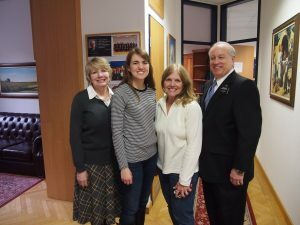 My aunt bore her testimony in Hungarian, which was so awesome that I nearly cried. Several members of the ward got up and shared how much they love Sister Smith and her testimony. In Relief Society, we listened as the sisters announced the Christmas project to serve the poor and the needy. I knew that many of those sisters were certainly not all that well off themselves, yet they are committed to serving those even a little less fortunate. The Relief Society provides relief wherever they go. This was one of the things that most touched my heart was learning about how the Church is growing in Hungary. What a stellar experience to spend a few days with a mission president and his wife and learn of the work. They have a stake and are continuing to grow. In the Buda Ward, a convert had just been baptized the day before and she was confirmed during Church–a beautiful confirmation. There was a baby blessing in the ward that day, too. We met a senior couple there helping with family history work and with the young single adults. Some members were in town for Church as they were from outlying cities and had come in to receive their Patriarchal Blessings. Several times as we were in the city, we ran into missionaries (granted many of them were on their way to the mission home). We got to meet a handful of elders who came in for paperwork. They were all full of fire and energy and a love of the mission. Hurrah for Israel! The work goes on. I love the work that my aunt and uncle get to do. 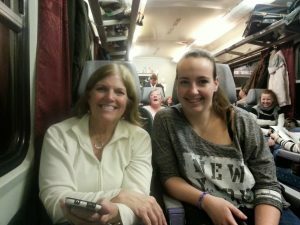 Speaking of which, on the train ride out of Budapest and on our way to Graz, Austria, my mom sat next to a young woman, and I next to an older lady. The girl, Rebeka, speaks English. We chatted with her a lot. She translated for the lady next to me. To both of them, we shared a bit of our testimonies and left a Book of Mormon. 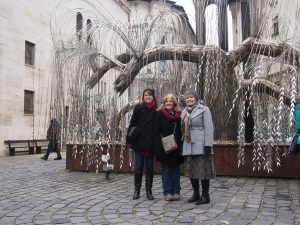 My mom and our new friend Rebeka. I loved it, rainy days and cold weather and all. I loved this. For reals.